DR. PHYLLIS J. MULLENIX, Ph.D. is a pharmacologist and toxicologist by training… In the 1980s, Dr. Mullenix was Head of the Toxicology Department at the Forsyth Dental Center, a world renowned dental research institution affiliated with the Harvard Medical School. She was invited to start Forsyth’s Toxicology Department because of her expertise in neurotoxicology. She is presently a Research Associate in Psychiatry at the Children’s Hospital Medical Center in Boston. Dr. Mullenix’s academic appointments, professional positions held, teaching experience, awards, honors and many published scientific research articles to her name are numerous. The first test Dr. Mullenix was asked to perform at the Forsyth Dental Center was a test related to neurotoxicity of fluoride. The person who asked her to perform this test was Dr. Harold C. Hodge, one of the founders of the Society of Toxicology. Since that time, Dr. Mullenix has conducted additional research related to fluoride including one study, which is about to be published. She is considered one of the foremost experts on the neurotoxicity of fluoride compounds.. Documentary, Dr. Phyllis Mullenix Fluoride Forum Clark University Worchester, MA October 24, 1996 Why haven’t they taken fluoride off the market? Evidence shows that it is a toxic poison. …POISON… Hitler’s doctors at the request of the furor looking for a way to control large populations, recommended fluoride to be put in the drinking water in the concentration camps. Many stores in the USA have fluoride enhanced bottled water recommended for young children. Permanent changes in children’s behavior with ADHD like symptoms. In summary “In summary, my opinion is that there are no advantages to water fluoridation. The risks today far exceed the hoped for benefit. Dr. Hodge during the Manhattan Project requested funds from Col. Stafford L. Warren to do animal experimentation to determine central nervous system effects of fluoride. He did so because he had clinical evidence that the fluoride component of uranium hexafluoride caused “mental confusion, drowsiness and lassitude among the workmen. Yet, he never got to do those studies, and because this information was classified, he never discussed his findings with me. Perhaps, however, this explains why he was so intensely interested in my fluoride studies up to the time of his death. Therefore, in good conscience I can only discourage the notion of fluoridating the water supply of Queensland’s household supply. The evidence against the safety of this public health policy will keep mounting and never disappear again. My ignorance of fluoride in the beginning was a matter of chance. If you ignore this evidence today, it will be a matter of choice. Watch this video as Phyllis Mullenix, PhD presents a credible and proven discussion with respect to the toxicity of water fluoridation. Her lecture focuses on the associated reception malfunction that could be triggered from chronic fluoride poisoning received from fluoridated water. 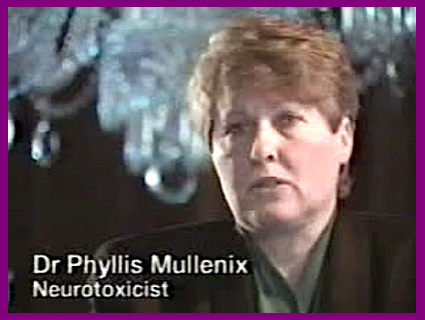 In 1995, Dr. Phyllis Mullenix resisted an enormous amount of political pressure to publish her investigation of the impact of fluoride on rat behavior (Mullenix, 1995). In her work she found that fluoride concentrated in the brain and that when the animals were exposed to fluoride before birth they exhibited behavior characterized as hyperactive, and when they were dosed after birth they became hypoactive (“couch potatoes”). You may like to read this again.